Organization really isn’t my strong suit. Neither is remembering things accurately. From here on in, these blogs devolve into a bunch of pictures with whatever I can remember to say about them. And they won’t necessarily be in sequence. Before I get started, I’d like to say a little bit about the Kiwi accent (New Zealanders call themselves kiwis after the wingless bird–go figure!) 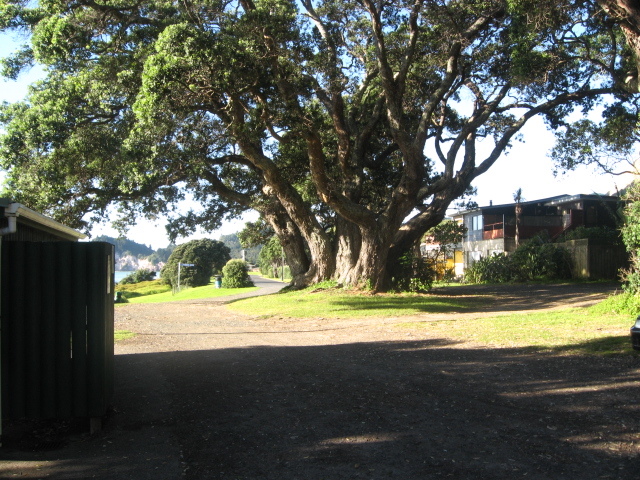 You see some strange spellings of place names in New Zealand–things like Whangamata. If no one warned you, you might think the word was Wang-a-maw-tah. It isn’t. Wherever you see the wh in a name it’s pronounced as F–sometimes Fw where the w is not voiced. So, Whangamata is really Fong-a-mah-TAAA with emphasis and lengthening on the last syllable. The letter e as in letter, bed, and wet is always pronounced like i in it. So those words are littir, bid, and wit in the kiwi ak-sint. The letter R is a very soft ah sound, and the terminal A in words comes out as an ar. The word idea is eye-dear. Law and Lore are homonyms. 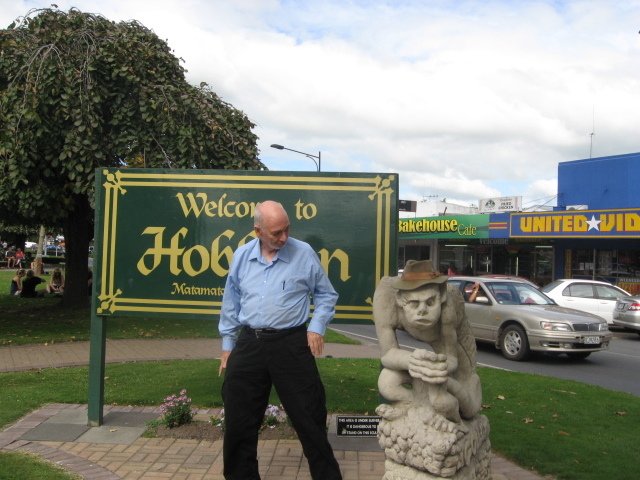 My friend Kevin on the south island is called Kivvin by everyone who knows him. Australians and New Zealanders, despite their propinquity don’t sound alike. Crocodile Dundee taught us all to say might for mate, but in New Zealand it would sound more like meet. I’m simplifying, of course, but that’s what it sounded like to me. I can only guess how flat my American accent sounded to them. I tried not to slip into pronouncing things the way they do for fear they would think I was laughing at them and having a go at their expense. And now, some pictures from the other side of the the world. 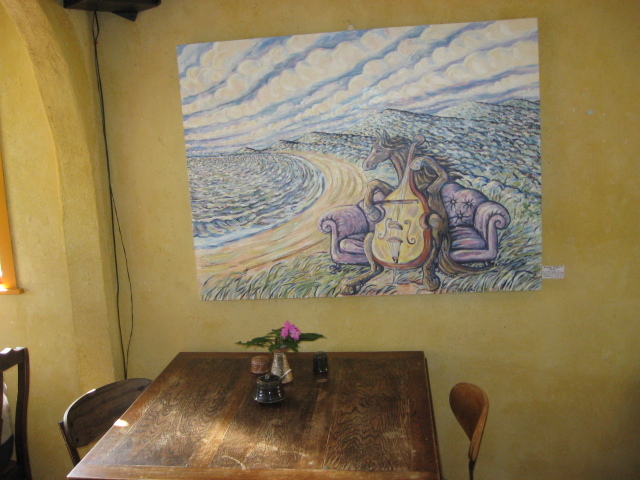 This picture was painted on a wall in Whangamata. 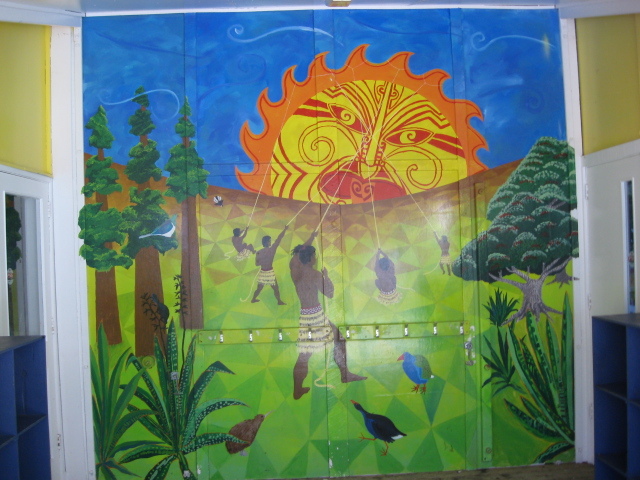 It looks like the Maori people dragging the sun up into the sky in the morning. I don't know what myth this illustrates, but my guess is that the central figure is meant to be Maui, the great Polynesian demigod hero equivalent of Hercules. 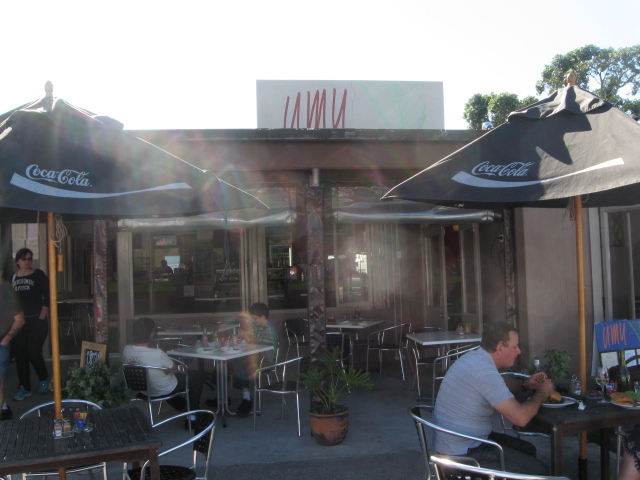 We stopped for lunch at this cafe in Whangamata on my first day of traveling around the North Island. We had already gone through the town of Thames and driven along miles of rocky beach. 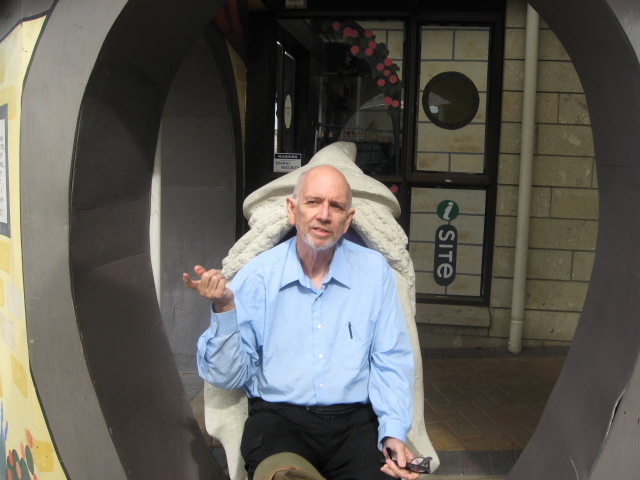 Mark said that Whangamata is a kind of artist colony, and I could believe it--the whole place seemed a lot like the main strip in downtown Scottsdale--lots of places to spend your tourist dollars. Mark and Charley are sitting at the deeper table in this pic. I thought this painting was strange enough to photograph. When I go traveling I like to visit the local bookstores. This was a combined bookstore/cafe near Whangamata. Mark found a couple of books to buy, but there was nothing here for me except the horse with the cello. I did find a copy of Nada the Lily by H. Rider Haggard in another bookstore in another town later in the afternoon. The offshore islands here and the beach below are marine animal refuges--protected national parks. 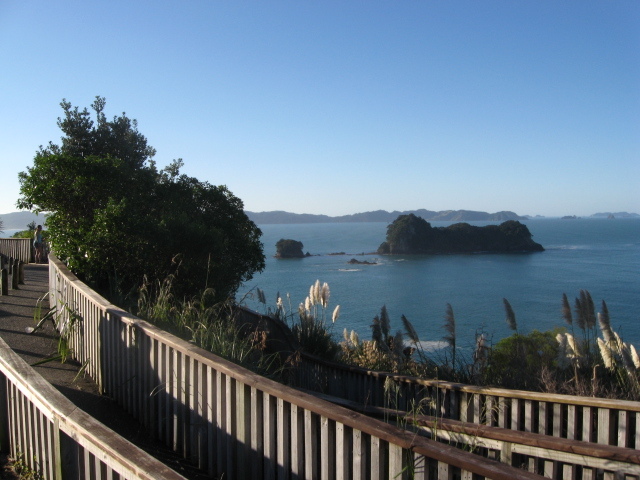 This is a truly beautiful part of the North Island coastline, and I went for about a 4 mile hike here--2 miles each way. 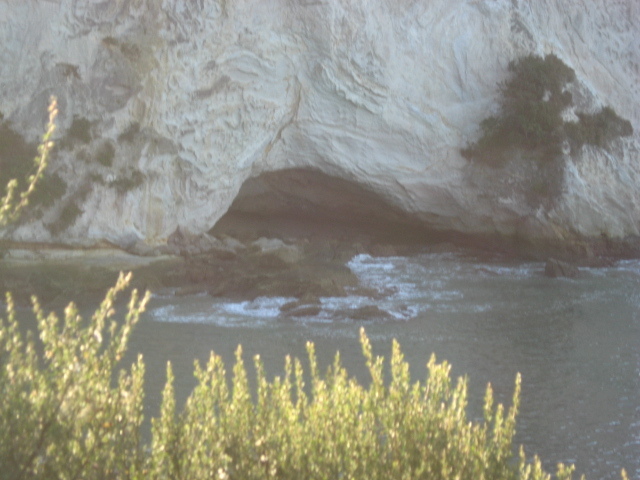 This is the marine cave at Stingray Bay. It looked like an interesting place to get down to, but the path got so muddy and swampy that I had to turn back. 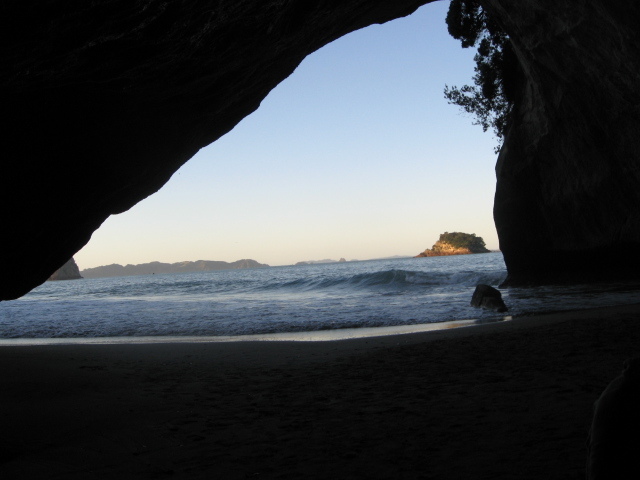 I am inside the cathedral at Cathedral Cove--one of the most famous tourist destinations in New Zealand. It is a huge sea cave open on two sides with beautiful white sand beaches in front of both openings. When the tide comes in, the two sides are cut off from each other. This is the only spot where I took my shoes off and actually let the ocean waves wash over my tired dogs, even though I was on beaches three times during my trip. It felt great, but it also got my feet all sandy and I had to walk back 2 miles with sand rubbing my feet inside my shoes--not so much fun as getting them sandy in the first place. 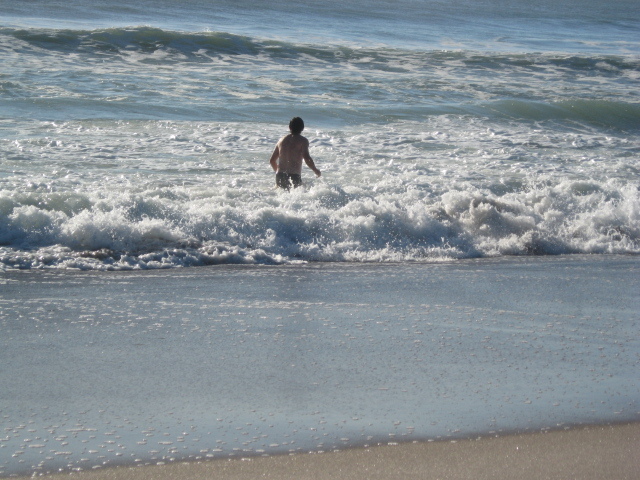 I'd like to say that's me in the surf, but it's my friend Mark. It is the next day and we're at another beach--not at Cathedral Cove any longer. This beach was notable for the rocks that wash ashore. I hear that mining operations on the coast break up some of the rock and it gets washed into the ocean, then tumbled along the shore until the reach their final destination. I searched for interesting rocks, but what I found were a few shells and two really pure pices of milky quartz--one of them is the size of my hand and probbly weights a pound. These huge trees grow near the beach in this part of the country. This was the biggest I saw. This boulder struck me as incredibly odd. 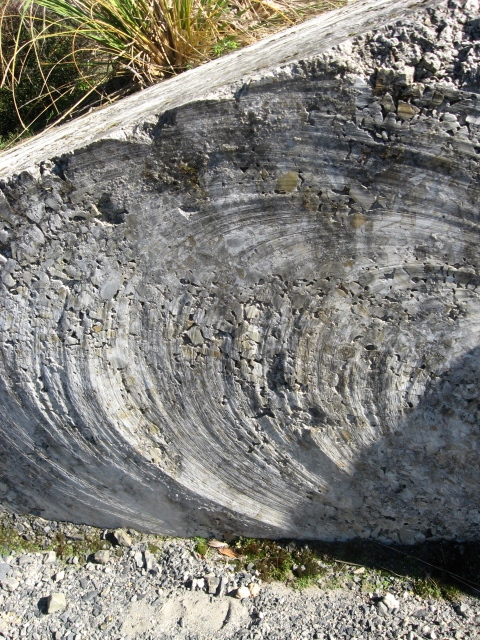 It seems to exist in circular layers like tree rings, and for some reason the miners here cut it open and put it where people could see it. This is a huge open pit gold mine, right in the center of a small town. From where I stood I couldn't see the bottom of it. Bulldozers, dump trucks, and other heavy equipment looked like toys inside it. The only other comparable open pit mine I've ever seen is the copper mine in Superior, Arizona. That was just copper. They are taking gold out of this big hole in the ground. 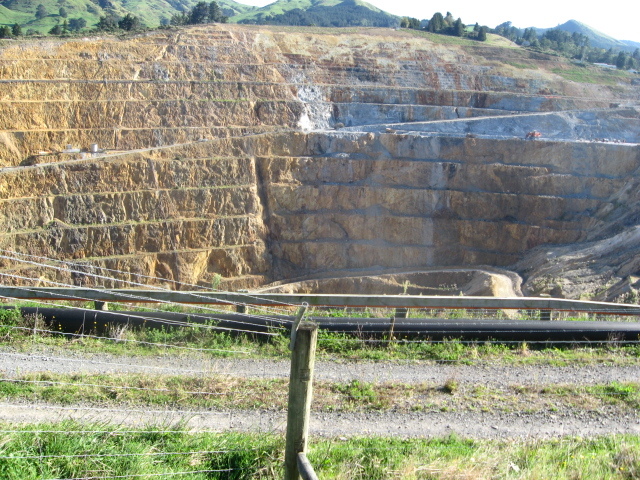 Gold mining is a big deal in New Zealand. 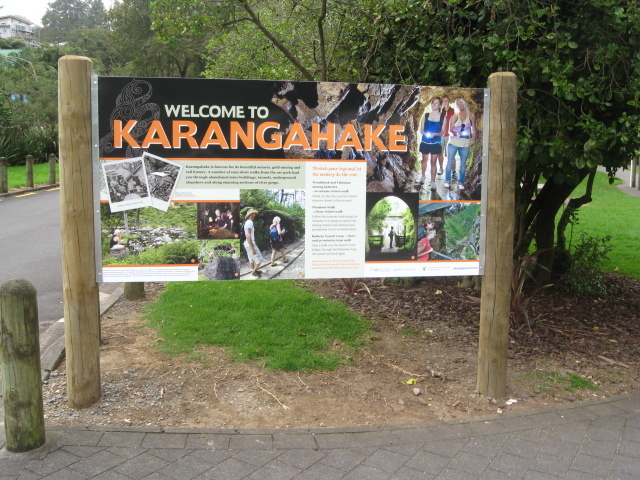 On the following day, we went by this park called Karangahake--the windows. It was a gold mining area at the beginning of the 20th century, but is now just scenic. It is notable for old mining tunnels you can still enter, and windows carved in the side of the mountain that look out on a gorge full of water. Here's a classic dungeon entrance if I ever saw one. 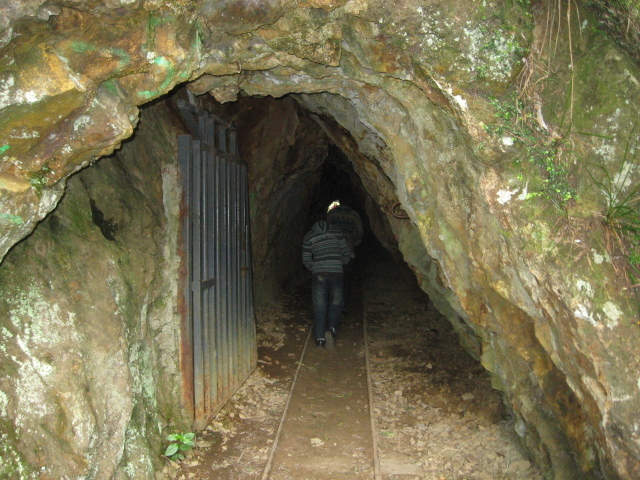 This is what a Dwarven mine would really look like--a narrow tunnel into the mountain accessed by narrow gage rails. There is no light inside the tunnel, and it got so dark we had to turn back. 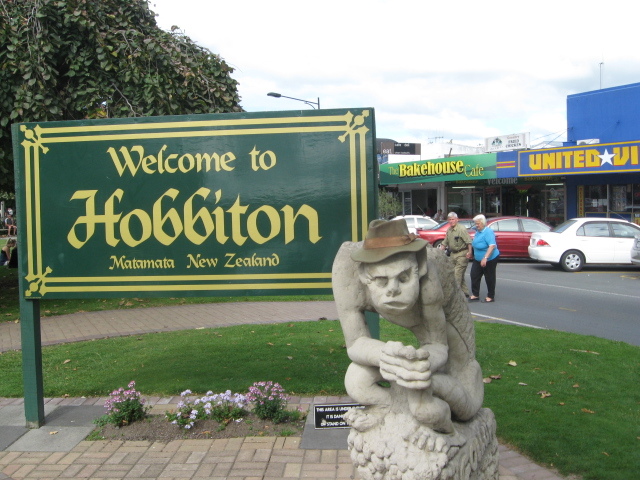 After visiting the Dwarven mines, we headed for the land of Hobbits. They are thoroughly modern now. Gollum stole the Trollgod's hat. Sigh! Gollum looks better in that hat than I do. After Gollum took my hat, Gandalf let me borrow his cloak. Do I look like a wizard? That’s probably a good spot to end today’s installment of Ken’s adventures in the antipodes. Be sure to come back tomorrow to see what else I might have for you. 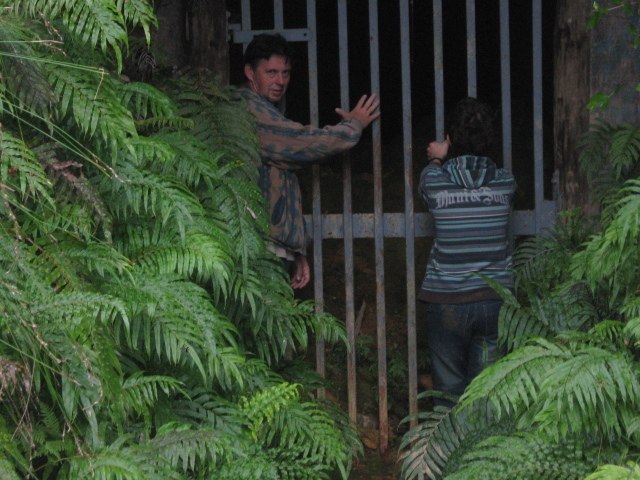 If you ever hang out with hobbits, explore old mines, or pick up rocks on the beach, please leave a comment.